There is an awful lot of confusion (and misinformation) out there about the practicalities of installing solar on a house that has a 3 phase supply. So I’ve written this post to clear up the confusion. 1) connect your solar system to only one of your supply phases with a single-phase solar inverter. 3) connect your system into all 3 phases with 3 separate single-phase inverters. Now that Feed In Tariffs are generally between 6 and 10c per kWh, compared to an electricity price of 30c or more , naturally people installing solar want to self consume as much of their solar energy as possible and minimise the flow of exported solar electricity. So most of the emails I get these days about 3 phase worry that if they choose option 1 they will lose out. They worry that any electricity they use on the 2 phases that are not connected to solar will all be imported at 30c per kWh no matter how much solar they are generating on the solar phase . I have personally never seen an installation where this happens. All the 3 phase meters that I have seen take into account the sum of all the electricity being used on all the phases and then subtract that from the amount of solar energy being generated to calculate the import or export amount for billing. i.e. if you are on a stingy FiT, they don’t penalise you financially for having a single phase inverter on a 3 phase supply. But to muddy the waters, I have seen evidence and heard from some installers that say they have seen 3 phase meters that have been configured to only calculate exports based on the solar phase. So buyer beware! Having said the above, it is important to note that it is not unusual for the demand across phases to be unbalanced; i.e. a lot more load on one or two of the phases. For solar financial payback this is less of an issue (due to the summed billing) however, from a technical perspective, balancing consumption and generation across the phases is a good thing for power quality. I have seen cases where voltage is problematic on a particular phase causing inverters to trip out; such as where a large pump or cool room is on that phase and presents high start-up demands. In such a case, you should consider putting the inverter on a more stable phase; they don’t like unstable voltage or frequency at all. Ultimately, a bit of instantaneous and energy consumption demand analysis should be considered a pre-requisite to connecting solar to three-phase systems. Your utility or perhaps a friendly solar installer can help with this. If you have three-phase, it is even more important that you choose a qualified solar installer to talk to initially, instead of a less qualified solar salesperson – who probably hasn’t got the electrical background to understand the nuances of multi phase electricity supplies! If you have a 3 phase supply, should you get a three phase or single phase inverter? 3 phase inverters start at about 5kW so if you want an inverter smaller than 5kW you are looking at single phase. If you want a system with an inverter larger than 5kW then your local Electricity Network may insist that you use more than one phase. The best way to do this is to use a 3 phase inverter. If you want a solar system with a total inverter capacity larger than 15kW (5kw per phase) then the relevant Australian Standard (AS4777.1:2016) says you must balance the phases. The easiest way to do that is simply to use a 3 phase inverter. If you have skinny wires from your meter to the grid, then you may have a problem with high voltage drops. If the voltage drop is too high you may not be able to install solar. A 3 phase inverter spreads the power across 3 phases, so makes the voltage drop on each wire 3x smaller. So if you have an issue with voltage drop – a 3 phase meter is a good solution. Otherwise if you are installing a system and have the choice of one single phase meter, or one 3 phase meter, the choice is yours. The advantage of a 3 phase meter is that it is a more robust system (lower voltage drops, phases balanced). The disadvantage is that is is about $600 more for a 3 phase meter. I’d pay the extra personally. Next Article: Japan’s solar revolution? I am getting very conflicting advice from sales people and installers on the operation of single phase inverters. Basically I have 3 phase power and looking at putting in 3kw solar system. Due to the size and cost it looks like all installers are proposing single phase inverters inverters, and are telling me the 3 phase inverters make it uneconomic. I am in NSW and my energy supplier does not pay any feed in tariff. So to make it economic, it is important that the solar system, offsets my total consumption before “giving electricity away” to the supplier. I am with Ausgride and will be net metered. 1.	it does not matter how much I push to the grid or take from the grid on each of the phases, the meter will offset any power I am using on 1 phase with the power I am exporting on the other phases. 2. I can only connect the solar to 1 phase, and any excess from that phase will be exported, and I will be charged the full rate for the electrify on the other phases that I might be importing at the same time. Can you confirm what answer is correct, or how I find out the definitive answer to this as it makes a massive difference to the economics of the whole system. •	I am using 3kw of power in the home. •	Power usage is evenly spread across the 3 phases. •	I have a 3kw system producing 3kw (yes I know that will never happen but keeping the maths easy and single phase inverter. I assume based on the above, under 1 scenario, I am paying nothing, and under the other scenario I am giving away 2/3 of my power, while at the same time paying peak rates to buy the same power back. Eg under billing scenario 1) I will not be being billed for any electricity from the grid (ie I am generating and using the 3kw myself). Under scenario 2) above, of the solar power I am generating I would be using only 1kw on the phase that it is connected, and exporting the other 2kw. But at the same time I would be using 2kw on the other phases and importing that from the grid. So under scenario 2) I would be actually being billed for 2kw of electricity which seems very unfair. Your expertise on this would be greatly appreciated. Just wondering if anyone has an answer to the above question. I am getting the same conflicting advice and am confused as to how the whole 3 phase/single phase net metering thing really works. I have three phase power and a 5KW solar system connected to the grid via a single phase inverter. When the solar is producing 4.2KW and all power to the house is turned off the arrow on the meter in the meter box shows that I am exporting power into the grid. When I turn on my three phase 1,5 KW bore pump (still with all power to the house turned off and still generating 4.2 KW of solar the arrow on the meter reverses and shows that I am importing power. Can you please explain this for me. Hopefully the problem is just with the arrow and you are only being billed for your net electricity use. If your solar system is producing 4.2 kilowatts and the only load is a 1.5 kilowatt pump that is consuming 0.5 kilowatts from each phase, then your three phase meter should net that out and regard your home as exporting 2.7 kilowatts. I would check what the meter readings say at those times. The total number of kilowatt-hours of grid electricity consumed should not be increasing while the number of kilowatt-hours of electricity exported should be. If this is not the case, then you should contact whoever is responsible for your meter and explain the situation and tell them it is not working as it should. Under Australian Consumer Law you can claim for consequential losses if you haven’t been receiving the feed-in tariff you should have due to the meter not functioning as it should. Whether or not it is worthwhile doing this only you can decide, but this fact may encourage them if they are slow to act. Today all phases are billed separatly if your meter has been changeout the last 3-4 years. They messure all three phases induvidualy. I have hade my new meter and a 3 phase 5kw inverter for 3 years now and even if it puts out almost 5kw at peak hours at noon thats still only 1.333w / phase. So if i use over 1.333w on any of the phases I pay for import. If i the water heater is on at peak time I export 2.66kw for 3cents and buy 0.666w for 20c since all phases are counted for individually. This is a critically important issue since the Power of Choice review, and hence all metering services moving across to the responsibility of energy retailers. What is the make & model of network meter, and who is the energy retailer that is billing separately on the 3 phases? I understand this has been the case for some years in some New Zealand “lines company” jurisdictions. I installed a 3 phase system in Auckland New Zealand, and with the meter showing zero net total power import/export both the import & export meters are counting whenever the phases are no in perfect balance & am charged accordingly (no net metering in NZ – export power is less than half import cost) – so I am giving energy away for free to both lines & power company bills (costed exactly about $5 a week – could do so as I had separate meters internally). Discussed it at engineering level with both liens company *& power company and they said that this is the instruction of the New Zealand electricity authority (and why would they complain if getting paid extra for nothing). If has known before would have turned off two phases, move all load onto remaining phase and bought a single phase inverter. Also contacted Energy Minister office and no reply (A green party MP is electricity minister but seems the greens in NZ are not interested in fair play for solar power). Apparently most retailers know of this but keep quiet – for the average person with 3 phase just their savings are less by about $250 a year compared with the single phase. The shame is that every school building, farm, small business who puts a 3 phase solar system up to help in the environment, along with appropriate feel good publicity from local energy & lines companies, is being silently rorted. The most elegant solution, if you have 3 phase, is to get a 3 phase inverter. They start at 5kW, and are pretty reasonably priced. Having said that, it is fine to use a 1 phase inverter with a 3 phase supply. The meter software takes into consideration the power used on the other 2 phases when calculating exports. So you only rack up export credits when the power used across all 3 phases is less than the power generated by your solar system on its single phase. And conversely you only pay for grid electricity if the power used across all 3 phases is more than you are generating from solar on the solar phase at that moment in time. Try getting in writing from SAPN or any other grid, that their meters will net out import / export across the 3 phases, they won’t do it. We have evidence of some doing so and some not (same meter model compared, in various states). Very hard for solar companies to make promises either way and be accurate, when relying on grid hardware and software. Mate I am getting exactly same conflicting info.If you only have to use a single phase inverter on a 3 phase system why would you bother using anything else.I’m still not clear what advantage 3 single phase inverters or a 3 phase inverter gives you. I am also in nsw.What did you end up doing because your situation is identical to mine including the size of system(3 kW).Please help!! For a 3kW system, unless your local electricity company demand otherwise, I don’t see any problem with using a single phase inverter on one of the phases. It is good practice to put it on the phase with the highest load, but a good installer should do that. I have 6kW of microinverters across one phase of my 3 phase supply, and have never had an issue. My meter only counts an import if the sum of my usage on all 3 phases is greater than the solar generation on the one phase at any instant in time. Just want to give you some advice on feed in tariff. I was with dodo and when I installed my solar system (5kw system and recently added Tesla powerwall 1) Dodo would not give me any feed in tariff. Basically they wanted my solar produced electricity for free. So I did some research and found out that about half the electricity suppliers will give you about 6 cents feed in. Doesn’t sound much, but if no one is at home during the day, it adds up. I have further expanded my system with another 5.440 kw system in preparation for the release of the powerwall 2 next month, now just waiting for this one to get installed. yes we are big electricity uses (not to mention any names MY WIFE and 4 children). I did not read all of your information but 12 months ago I installed a 5 kw solar system. My house is on a three phase system. I had to pay an extra $800 for the inverter. I am in queensland and do get 6 cents feed in. I could get 13 cents but doi not want to change my supplier as yet. Energex installed the new metre at an additional cost if $600 all worth it. The metre tells you when it is feeding into the grid with an L shaped arrow. I have worked out the times it normally starts as my panels do not get very early sun or very late sun. I am feeding in from 0930 to about 1630. I put a timer on the hot water and took it off of night rate. I run the hotwater, pool pump and any other things such as washing or using electric appliances during those hours and i do not pay for power unless it is wet and cloudy. I have a big house and I save between 100 and 150 each qtr. 5 years my system will pay for itself. I would hope good batteries will be out by then and will be cheaper. The new ones from israel will out perform tesla by far. Most of my electric bill comes from service supply cost, gst, and govt charges. Actual usage is cheap so i hope by installing a battery i get rid the corrupt govt charges. make it in 1 phase? We recently installed solar in our 3-phase home. We planned to get two single-phase inverters for two of the phases only. We got the run around by a company that has been around for many years-with a name that sounds like a dog with a hair lip. I guess my message to you out there is not to accept anything that the solar power sellers say. Check the internet, check the solar blogs, check the technicians that the power companies provide. There are three entities in the process that, in our case, were independent of each other:the salespeople, the company and the installers. The salespeople will tell you what you want to hear, the installers will do what they wish, regardless of the contract, and the company will take your money. Ah well, off to the ombudsman! I will let you know the outcome. I am trying to size a solar system for commercial building which is using 3 phase. I have never done the calculation for 3 phase but familiar with the single phase. Appreciate if you can provide me with a sample for sizing 3 phase solar power system including back up which I can read and follow. I am talking about a total of 4500kWh/year. Your CEC Accredited designer certification would have covered this. I live in Queensland and have the same problem as Matthew above – where a 4kWh solar system is connected to one phase of my 3-phase home power. In short, I’m not getting maximum benefit. The system produces 20kWh per day on average, and I’m using about 10-12 kHw – with the balance being fed back into the grid at 8c – soon to be zero. My question is – how can I use the entire solar production – without exporting any to the grid? Do I load up appliances on the single phase? Or do I upgrade inverter to a 3-phase unit? Alternatively, can I spread the single phase inverter across 3-phases? Rob, are you saying that your meter only does the import/export calculation on the “solar phase”, and any power used on the other 2 phases is always imported? Yes Finn – that appears to be the situation. Each day I export 4-6Khw power – that could be put to good use on the other two phases. The easiest solution is probably to put all your appliances on 1 phase if possible. With the power-draw you are talking about I don’t think there would any power quality issues. Thanks Finn – I figured that would be a solution. In saying that – a need exists for an electronic device to be inserted between the inverter and solar meter – that monitors phases and sends solar power to the phase in demand. This wouldn’t be difficult to achieve and would solve the problem. there is such a system – I think ! If you want to make use of all the power you make during the sunny times you must use a 3phase inverter. In the situation where there’s a import rate and export rate You are being messed up. Because say your Ac isn’t on the phase with the solar. Your being charged 10c. Where your getting 6c back. I may not be 100 percent correct, however it’s best to use all the power you make across all the phases. Then export. So I figure three phase systems need 3 phase inverters. Oops – fixed up – thanks Frank! Firstly, installing 3 x inverters is multiplying the probability of failure. Secondly, when 1 inverter fails, you’ll have to pay an electrician to come replace it. Then another one will fail and that’s another call-out fee to replace it. And then finally the third inverter will eventually die and that’s ANOTHER electricians fee. A three-phase inverter is the smartest choice. I have a single phase house. with a 5kw system in Adelaide South Australia, I am thinking of putting in some three-phase woodwork machines in a shed. I am not sure what is involved in retrofitting three phase to my surburban house to do this, Can you please explain what would be involved and how this may affect my solar system. Hi puffytmd, I live in Willunga, South Australia and have asked a similar question. You can run a three phase motor on 240v single phase if the motor is wired in Delta configuration through a VFD. It starts to get messy when you have multiple three phase motors as I do. Chunky, and only remotely acceptable if the motor/drive application suits variable speed, such as an irrigation system or solar pump/bore pump scenario. Hi I have a farm that has a two wire 240 volt single phase supply connected and the cost to add another line and change out the transformer to 415 volt three phase one by SA Power Networks is not justifiable. If it is possible, please specify a suitable 6kW three phase, off grid solar system with batteries so I can run my three phase equipment. 12 months later and no comments. I didn’t think I asked such a difficult question that no one could recommend a solution. What I would like to do is to install a 3 phase power system running from batteries and a single phase solar system to charge the batteries with excess power fed back to grid? Would this be practical to do? What equipment would be required? My other option is to purchase a phase changer to convert single phase 240v to 3 phase 415v. There is an Australian made 4kW Phase Changer that sells currently for $3575.00. Does anyone care to comment? Yes this is very a very standard set up. You need a 3 phase battery inverter such as the Fronius Symo Hybrid and a solar installer/designer that is qualified to install batteries and you will have a 3 phase hybrid system. You can get 5kW of solar and a 7kWh battery installed on 3 phase for $15,000-$20,000 at the moment depending on hardware. After reading comment I have noe a need to know more. I had a 5kva system installed with a 3 phase inverter. How do I tell if my system is pumping 2 phases into the grid when it is working. I note on the digital reading I have 3 phases pumping at 240 v.
How do I know that i am getting the benefit that I should. I only installed this last year so am at the mercy of companies to reduce my bill with feed in supply. It is very hard to get information from the installers although the electrician was and is good but hard to get as he works all over installing for the company. I also had my circuit board completely rewired and configured. I also know that the systems panel location is not perfect. I was informed the location would guve me 93 or 97% but I dont believe this as I have only seen the system run over 4000 a few times. on average it gets to 3500, does not get to that until about 9.30 to ten in the morning, dropping at about 4Pm in the afternoon. Can you advise what I should look for or test. The first thing you can do is check to see if you are being paid a feed-in tariff on your electricity bill. It is extremely unlikely that this figure would be incorrect in the long term, but sometimes electricity bills are based on estimates, so it is possible for it to be off. You should be able to check on your electricity meter how many kilowatt-hours of solar electricity your system sends into the grid, if you want to double check. When your installers told you it would operate at 93% to 97% they probably meant as a percentage of a typical north facing system. Pretty sure you could do this with 3 x Selectronic SP-Pro, configured for 3-phase, sharing a battery bank of your choice, with the array either DC coupled using MPPT charge controller, or AC coupled using Kaco or ABB-SCERT string inverters. Would need to export excess on only one phase, which would be possible, just can’t get my head around the configuration at this point. Find a local off-grid installer who works with SP-Pro. Talk to Selectronic. Jeff I have just now seen your post. And yes there is a simple solution that is commonly used that satisfies precisely what you want to achieve. Install a 3 Phase Stand Alone Off Grid system as an independent 3 phase supply source for any circuits you want. Pumps; motors; commercial equipment, general circuits and split phase circuits. This is efficient, effective, robust and simple with very low hardware overhead and also of course sets up the opportunity to DC couple any amount of battery storage you might want (example a small DC coupled battery bank sized for security lighting for the premises at night). This system has no connectivity at all to the grid or any circuits you choose to connect to the grid, and has no connectivity to any other On Grid system you might be using at the premises. Multiple PV generation systems are entirely separate on the AC (any number of phases) side, and can be supplied from a common Solar DC Bus design, but depending on the installation of the On Grid system network arrangements in place. A better PV arrangement though is to supply the 3 Phase Stand Alone inverter from its own Solar PV Bus design. Standard practice – and I suggest you discuss this point with an experienced energy solutions engineer. All the best for your project Jeff. In my area the DNSP is Essential Energy, and I have seen testing & documentation supporting the fact that their grid interactive meters do sum the phases before recording an import or export on the appropriate register. In other words, if you’re with Essential Energy, the metering does the fair thing if you have a single phase inverter on a 3 phase supply. If you were to move the majority of loads to one phase on a poly-phase supply such that the maximum demand is out of balance across phases by more than 25 Amps, you would be in breach of AS3000. Keeping the phases balanced is the reason that most DNSPs will only allow 3-phase inverters(or 3 inverters) when the inverter capacity is greater that 5kW AC nominal. I’m interested to see tests and documentation from other DNSPs. I am looking at installing a 20 panel solar unit with a 5kw inverter,I have ducted air running on 3 phase should I install a 3 phase inverter or 1 phase, the solar company say to put in a 3 phase and change everything to 3 phase is this correct? In your situation, I’d go for a 3-phase inverter. It’s a better solution if you have a big 3-phase appliance, and it takes care of balancing the solar across the phases. Is there a 3 phase coupling that is battery ready for a micro inverter system? Any AC coupled 3 phase battery inverter should do the trick. Any that you could suggest?The SP Pro 3ph is 12 kW and far too expensive. Are you sure you need a 3 phase battery inverter? Depending on the local regulations – you may be able to put your battery and solar on just one of the 3 phases? The Fronius Symo Hybrid is a 3 phase hybrid inverter. can i run a fly ash brick making machine ,which runs by three phase electric motor by using electricity generated by the solar cells..
a. One inverter 1-phase for the total system ? c. One single 3-phase inverter? Hi to you all, I have a discussion on solar system. I have three pieces of single phase inverters. But my load is 3phase type. Please how can I make connection so as to run 3phase load? You get your qualified solar designer to design a system where 1 single phase inverter goes on each of the 3 phases and you split the panel array between inverter. Or you sell the inverters on eBay and get a single 3 phase inverter. Why on earth would you have 3 x 1 phase inverters? 1. Installations that have a feed-in tariff greater than the import tariff are programmed to use the single phase system ie the export is the excess energy generated over that consumed by one phase only, the one the inverter output is connected to. This amount displays as register 40. These are the older installations (before July 10, 2012) which have a mandated feed-in tariff of 44c/kWh minimum until July 1, 2028. The inverter output is best connected to the phase with the least daytime usage. 2. Installations that have a feed-in tariff less than the import tariff generally have a single multiphase meter which is programmed to use the three phase aggregate system. The energy exported is the excess energy generated over that consumed by all three phases in total, even though the inverter output is connected to one phase only. These are installations after July 10, 2012 and which now have zero mandated feed-in tariff. However, retailers do offer varying feed-in tariffs up to 11c/kWh. It is irrelevant to which phase the inverter output is connected. 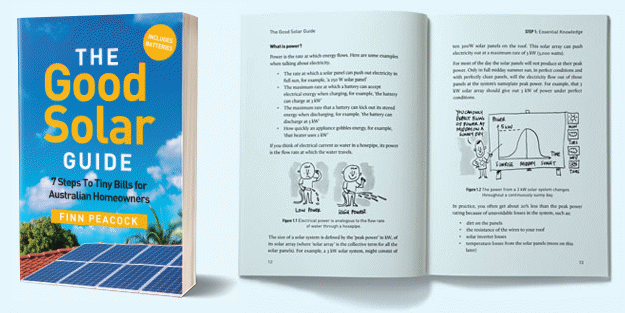 Both of the above programs provide the greatest dollar benefit for the consumer which is the intention of the Queensland Government Solar Bonus Scheme. Both scenarios 1 & 2 could be inadvertantly misprogrammed by the meter installer resulting in a lesser benefit for the consumer. Hi, I’m using a 5kwh 3 phase system with single face inverter. I used to check my solar generated rate is about 15kwh per day and the saved energy consumption is around 8kwh per day.. but now I checked again the saved energy consumption drops a lot, i can only use about 0.12kw from my generated energy per day, and all the rest been exported. I checked with the solar company, they told me because i m using single inverter so all the generated energy been exported from the other 2 phases without the inverter. But it wasn’t like what it used to be. Can anyone told me what i should do with it? How many meters do you have? A single 3phase meter or multiple single phase meters? hi, its a single 3 phase meter. In that case – you need to check how the net metering is configured in your meter. Your meter should be configured to, every second: add all the imports together, then add all the exports together then subtract the totals from one another to get your ‘net imports’. Your meter may be one of the few that is ‘hacked’ in the retailers favour. If it is then don’t stand for it – get it changed. Go to your local ombudsman if you have to. thank you so much for your explain,Finn.have to take it to action now. The irony is 3-phase inverters are childishly simple to design. With 3-phase you always have an outlet for your panels power. With single phase, at zero-crossing you have to store the power and try to noiselessly as possible dump all of the stored power back into the grid. I live on a rural property. I have 9 Solar panels and I am aware that their output is 415 Volts DC. Is it possible to build a 415 V to 12 Volt DC converter so that the power produced can be fed into a bank of 12V batteries ? Alternatively, is it possible to change the wiring in or from the solar panels so as to lower the output voltage to around 140 volts and hence requiring a converter that changes the output from 140 volts to 12 volts. John what you are describing is called a DC Coupled system. DC Coupling is the most efficient integration of Solar PV and any other DC power sources and particularly useful with battery banks. This is referred to as (designing a DC Bus). This is also the most appropriate, efficient and safe, design for Off Grid solutions. Not many electricians though are fully understanding of integrated DC power source (DC Bus) design principles and how to exploit the unique attributes inherent in PV technology (equivalent circuit) and integration with battery banks, because this engineering sector is not that common in Australia at the moment. Find an experienced (integrated DC systems) energy engineer that can assist you with these points and you will learn how this simple and very effective engineering design is dealt with reliably and functionally in hardware. What you are thinking though about DC : DC conversion is not good design by any metric for the outcomes you want to achieve. All the best with your project John. I have heard that all 3 phase inverters apart from the new SolaX 10kw cannot distinguish between the different phases. They see them as one entity. So if you have a heavy draw on one phase and little or no draw on the other two phases, the inverter will send the power equally down the 3 phases regardless, so that the two light ones effectively export back to the grid for peanuts and the heavy load is matched to some level. Seems to me this is a fatal flaw. A 3P inverter can rarely achieve more than 50% efficiency in the sense of household self consumption. If you have a battery attached as with Fronius Symo, it gets worse because the inverter will actually drain the battery and sell battery power to the grid. I would be interested to read any comments you may have. Your meter will only measure net electricity use, so if one phase is drawing 2 kilowatts from the grid while the other two phases are each exporting one kilowatt, as far as your meter is concerned, your house is using no grid electricity at that time. Correct me if I am wrong, but in the above example, if one phase was drawing 2 kw during the day then the solar system would be supplying that to some extent, but at the same time it would be exporting on the weak phases. So for example, if your total possible solar production was 3 kw/hr, then one kw per phase would be going down each phase, and the remaining 1kw for the heavy phase would be drawn from the grid. So your house would be using 1kw of grid electricity despite producing 3kw of solar output. This is why one single phase inverter per phase makes sense, particularly with large installs incorporating batteries. Regarding batteries, the above example, if it was night time and we had a solar battery connected to the 3P inverter, and its discharge rate was set at 3kw/hr then 2kw of solar battery electricity would be sold back to the grid and only 1kw of battery power would be used by house and you would still be importing 1kw of grid energy at the same time – which is incredibly inefficient..
On another note, exports are paid much less than imports are sold by power companies. I think an export/import meter measures this and is set by the power company at the set rates so that one import of 1kw costs 25c and one export of 1kw costs approx 8c. I don’t believe one export cancels one import leaving you with a net bill; but if you have some evidence to the contrary I will gladly look at it. If a house was using no electricity and exporting one kilowatt of solar electricity on each of its 3 phases and then an appliance on one phase that drew 3 kilowatts was turned on, that phase would use the one kilowatt of solar power being supplied to it and draw 2 kilowatts from the grid. But because the other two phases would continue to export one kilowatt each, the meter would look at the 2 kilowatts of grid power going into the house, and the two kilowatts of solar power leaving the house, and say that as far as it is concerned they cancel each other out and the house is currently using no grid electricity and exporting no solar electricity. I’m about to start building a new house on Northern Rivers NSW and am looking at installing a system using 10KW of panels and a Tesla 2 battery with incoming 3phase power for the air conditioning. I understand that micro-inverters on each panel or bank of panels improves efficiency but are interested to learn if they can be used with 3Phase and if so should they be DC or AC. As for your Microwave – that is kind of ridiculous if you are connected to the grid. Solar power is 240V AC just like the stuff from the grid. My guess is that it is a hangover from many years ago when solar was almost all off grid. You don’t want appliances with peaky usage on a small off grid inverter as it can easily trip it. Don’t worry about the microwave – it will be fine. Don the Miele microwave advice was correct. And as an ‘almost’ hard and fast rule (with a few exceptions only) no AC appliance at all should ever be connected to Solar DC direct; and expect it to work as designed, and it will most certainly become a highly dangerous and unsafe circuit. AC appliances need steady state AC supply. You have confused terminology here. AC circuits are supplied from an AC power source that comes from the AC Output of an inverter, who’s DC Input comes from a Solar DC Input source. Hope this info clarifies the subject a bit for you. so I have just spoken to a solar company how has informed me that because I habe 3 phase I can only connect one of these phases to the battery storage system to use. therefore the appliance on the other to phases can not use battery power. is this correct. If you have three phase power then generally a battery system can only be connected to one of those phases and only supply power to appliances on that phase. So that is correct. It is possible to work around this so the battery system will, in addition to powering appliances on its phase, export power to the grid equal to the grid power being imported into the home on the other two phases. This will result in the electricity meter cancelling the two out and regarding the home as using zero net grid electricity. Setting this up is likely to involve extra expense. I’m in NZ and I have spoken to several import/export meter installers here who work for local power authorities. They reckon this article is incorrect for NZ, it is possible that it is true for Australia but the govt. standards for solar systems are basically the same so it is unlikely. They reckon exports are calculated at one lower rate and imports are calculated at one higher rate, and one export of solar energy definitely does not rub out one import of grid energy if calculated at different times or even at the same time. Where are you getting your information from please? Do you have a professional import/export meter installer who can verify this article? Thank you. How is NZ? I’m flying to Nelson on Thursday to ride the Old Ghost Road. This is an Australian site. The .com.au gives it away. The information is 100% correct for Australia. How does consumer load use grid power and solar power whole day?? Grid connection taken by consumer is 3 phase also solar inverter is 3 phase. The three phase electricity meter looks at all three phases at once and only records the net amount. If more electrical energy in total is going into the building than coming out as far as the meter is concerned the business is using grid power regardless of what is happening on an individual phase. This whole thing about 3 phase is concerning.i have 3 phase and 3 meters. I run a ducted aircon so in the first instance want to ve using all my power andthen any deficiency is made up from the grid. I got quote for a 5kw today using micro inverters. My understanding is all outputs are paralled up meaning each panel supplies 1/20 of the current with a 240ac out put. Ii have no idea. How the solar power is fed into thd system so if uses my power first. My concern. Is that if it only feeds one phase i will bd buying grid power on two phases . Assuming i was using no power what so ever, ie all my switches were open how is the feed back power measured and metered. Obviously my metres just measure my energy usage.. It would seem to me that power generated and used needs feedng into each phase after the metering and also some circuitary must ve employed to draw power from he solar first.Simply having a parralel feed would draw equal power from the grid and solar . I do not know where people get information from. If you are in qld energex installs a knew metre for solar. about 6 to 800 dollars on top of your solar. All phases will feed the grid. The metre will tell you when you are feeding into the grid. That is when you run your aircon for free. obviously when panels dont have full sun you will pay to run aircon. We were wanting to install a 5.2kw inverter with approx 6.2kw of panels in Geraldton, WA. As we have 3 phase, it would apparently have to be over 2 phases as that is what ‘feeds’ the house. Western Power have refused this as the grid or transformers in the area will not cope, so will only allow a 2.5kw system with a 1.5kw inverter on 1 phase and a 1kw inverter on the second phase. Cost for this system is $5300 original system would have been $8500. As we are heavy users, with temps quite often in the 40’s, so using a large ducted A/C, and daily average for last bill was 45 units we would appreciate advice on what would be the best way to go. I am afraid that if a 2.5 kilowatt system is all Western Power will allow, then 2.5 kilowatts is all you can install. In other states you’d have the option of export limiting your system and installing a larger one, but this isn’t permitted in Western Australia. If you want to become more energy independent you have the option of installing a solar hot water system. But as Geraldton isn’t that cold you may not consider it worthwhile, especially if you have gas hot water and don’t want to get rid of your gas connection. Is the following comment true? Suppose a residence has a single phase inverter, which is connected to the phase with largest demand. However, it a 3 phase inverter is installed, then this surplus power can now be consumed by the residence. That is correct, but the electricity meter will only measure net household electricity consumption. So if a home is importing 3 kilowatts of grid power on two phases and exporting 5 kilowatts of solar power on the third phase, as far as the electricity meter is concerned the home is consuming 1 kilowatt of grid power at that time. I have a rural acreage with 3 phase underground power connected via underground cable to the meter box at the boundary, and from there on to my shed, also via underground cabling. I am considering settling up a solar panel array on the roof of the shed sufficient to feed 15 kW back to the grid for at least 4-5 hours a day during the warmer months. How do I best determine whether any existing voltage drops between the shed and the meter box and/or from the meter box to the grid are likely to disallow 15 kW max to be fed into the grid. Can an electrician do this for me, or is it a job for AusGrid. Since I do not live on the acreage as of now, if a feed in tariff of say 12c/hr is applied, is there any likelihood of a financial benefit being gained in the longer term from feeding 15 kW into the grid for an average of 4-5 hours or more during the warmer months? You can download, “Grid-Connected Solar PV Systems: Install And Supervise Guidelines For Accredited Installers”. In section 8.5 on page 25 there is a table showing cable widths and maximum lengths. Unfortunately, it only gives information for 5 kilowatt and 10 kilowatt 3 phase systems, but with 25 square mm cross section wire you should be able to install your inverter over 100 m from your connection point to the grid. Normally your solar installer will handle the wiring from your grid connection. If you are asking if you can make money from just a feed-in tariff without using any electricity yourself then the answer is yes. If your panels generate an average of 4 kilowatt-hours per day per kilowatt, then a 15 kilowatt system will produce around 21,900 kilowatt-hours a year. At 12 cents per kilowatt-hour that will come to around $2,600. If your system had a total cost of $15,000 then with a 12 cent feed-in tariff alone it would have a simple payback period of under 6 years. But there is a danger that feed-in tariffs would fall over those 6 years. Thanks for your advice Ronald. Most helpful. Thanks for this information – it is indeed a confusing subject. I have 3 meters in my meter box – I presume it’s 1 for each phase. One of the phases is used considerable more than the others. It appears to me that the only appliance using the 3 phases is the air conditioner. I have a 3 phase 6.6Kw solar system and really have no idea as to how this works. I’m hoping that the inverter is not simply splitting the power generated equally between the 3 phases but is splitting based on demand. If not, I’m not sure my supplier is aggregating it across the 3 meters. It’s a new system – I guess I will find out when the first bill comes through!